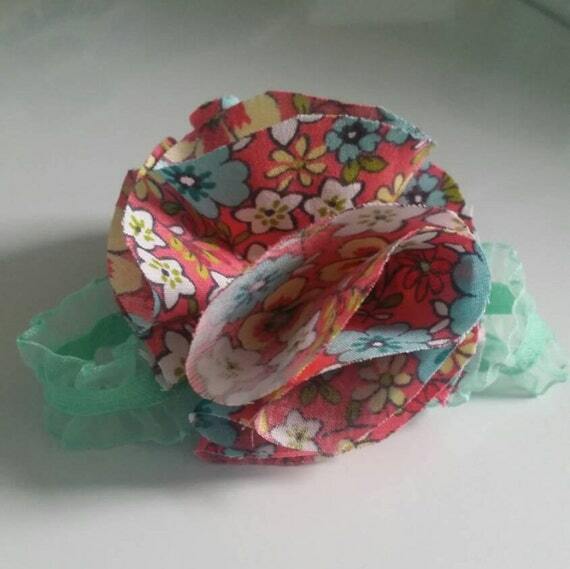 Making the fabric flower barefoot sandals this morning inspired me to make another pair this afternoon. 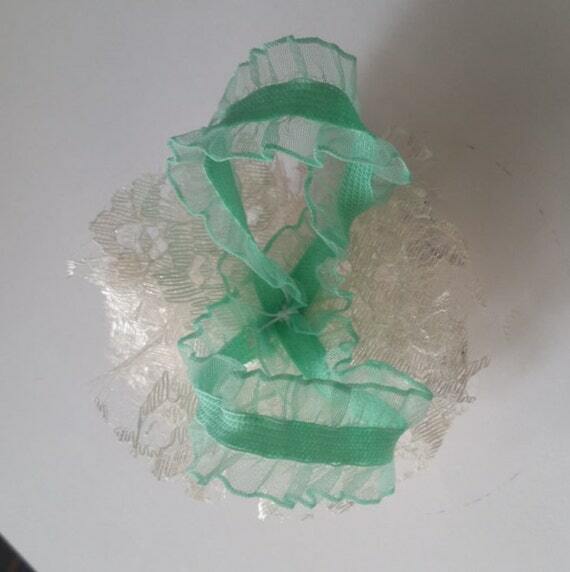 This pair is a beautiful and very feminine ivory lace and mint green ruffle pair. The texture is eye catching and will match most spring and summer outfits, as well as her dresses for church and special occasions. 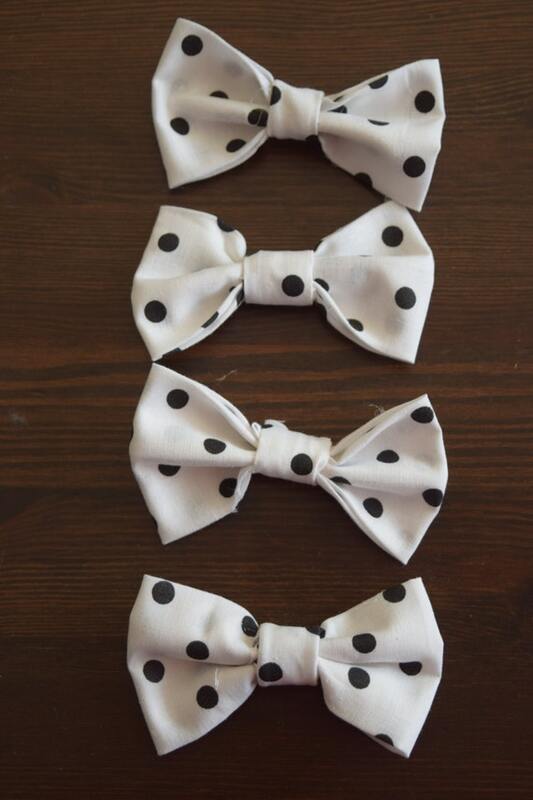 At only $6 a pair, you can't miss out on this accessory! They come in sizes Newborn-12 months, but I will honor special requests for larger sizes if I'm able to. Hello friends! The sun is finally shining after way too much rain and cloudy skies and I have spring.on.the.brain!! I've had a lot of barefoot sandal views on my Etsy page lately, so I'm guessing everyone is getting a touch of Spring fever! Today I added a new barefoot sandal to the shop and I have to admit that I am in LOVE! These sandals are for little girls age newborn-12 months for the spring and summertime. Sandals can be expensive for littles that age and they grow out of them so quickly. 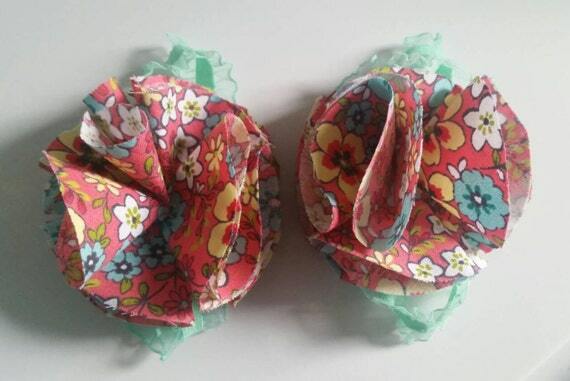 Because these are elastic, they stretch with your daughters as they grow and last a little longer. 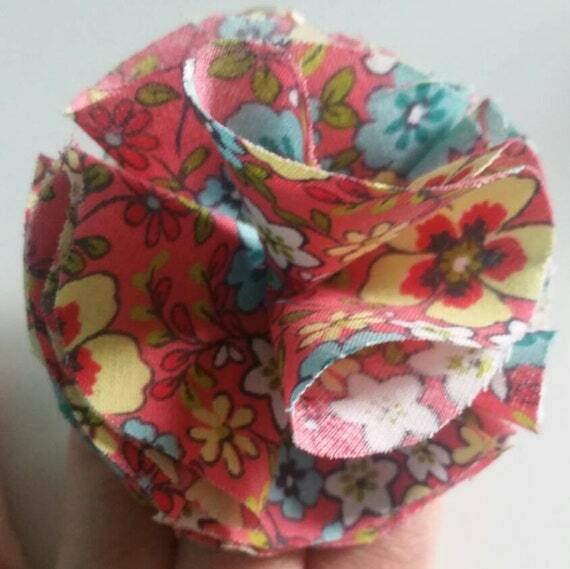 I hand stitch each petal of the flower onto the elastic. 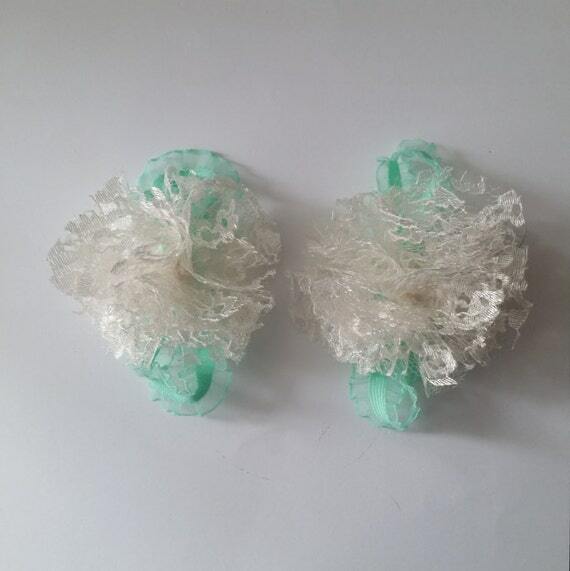 These sandals have a very unique look with the ruffle elastic and the colors are beautiful. Order yours today, they're only $6! Quantities are limited! You an visit my shop here to purchase. Make the most of your tiny workspace! I mentioned in my family room tour that I have a small workspace in the back of the room. I don't want to miss out on family time, but sometimes the only time I can catch up on work is on the weekends or when Jonathan gets off work. This little workspace in the back of the family room is perfect. When I need more room, I relocate into the dining room, which is where we do a lot of our crafting and projects already. One day I'll have a studio, but until then, this fits my needs perfectly. I got the desk from my parents basement and painted it yellow for when it went in our kitchen. 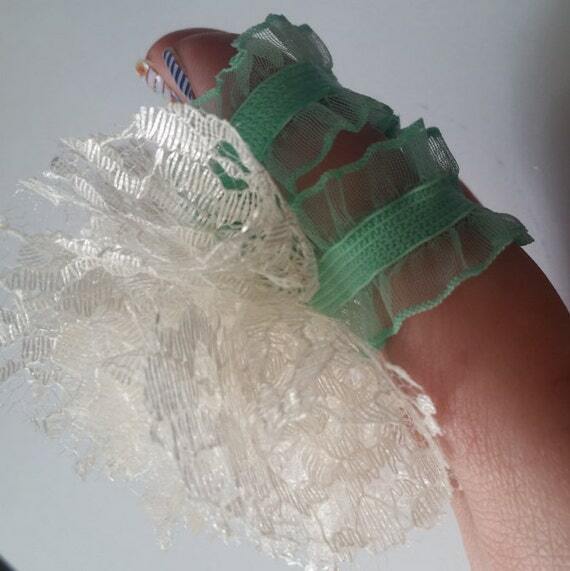 I'll be repainting it soon. The chalkboard is a mirror that I got from the thrift store and repainted. I use mason jars with chalkboard labels for desktop storage and all of the drawers are organized with various supplies. I also got the bamboo tray/basket from the thrift store and I use it to hold current fabric that I'm working with. I definitely prefer chalkboard markers over chalk. It look so much nicer too. I keep my planner, journal, and binder on the desk. I can use the sewing machine on the desk for small projects, but move it into the dining room for larger ones. This is the perfect verse, isn't it? I store my yarn, fabric and laptop in this armoire along with other supplies. It's right behind my desk and it saves so much space on and in the tiny desk. Here is my little nook tucked in the back. You don't have to have a huge space for working. With some creativity, you can make the most of any little space in your home. Our family room is the heart of our home. For some people it's the kitchen, but not for us. 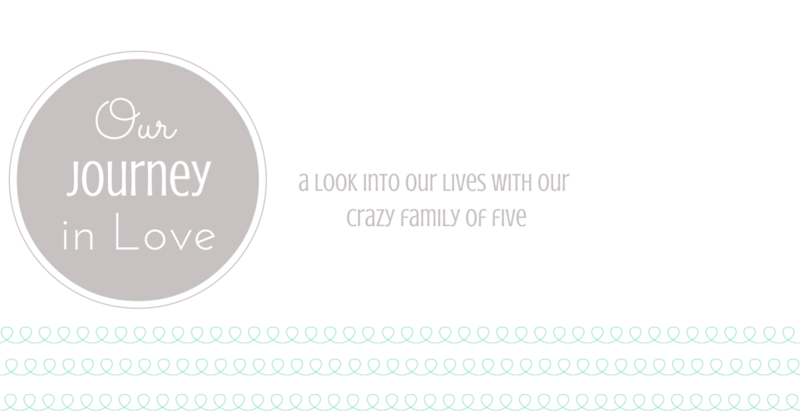 We love movies, cuddling, and there is so much room to play and dance in the family room. The ceilings are high, the room is very large and it's tucked in the back of the house. After I started Madsy Bella Boutique, I needed a desk space of my own to work and I added a small little desk in the back. So when I need to catch up on orders and make plans for the business, or even do some quick sewing and organizing, I don't have to leave the family room, everything is right there. This is the view coming in from the foyer. The room is also sunken, so it makes it feel extra cozy to me. When I redid this room, I only paid for paint and the rug. The couches, chairs, and the buffet that the TV is on are second hand from my in laws. The shutters are pantry doors that my parents got off the side of the road. I painted them white and hung IG photos on them with mini clothes pins. The armoire next to the couch is furniture that I bought after I graduated high school! It's been in every room in this house. I can't let it go. I got the table that's in between the chairs from my grandmother and it's on it's second paint job. Here is the TV stand and shutters again. The buffet is excellent for storage. We have our video game consoles and internet stuff inside the cabinet, along with controllers, cords, the kids' DVDs, etc. Jonathan just drilled a hole in the back of it so we could pull the cord through and the shutter on the left is hiding the cord mess. We have kids. I'm not trying to hide that fact, so we have a few bins and baskets with toys. I also added some bright colors for whimsy. Here is a detailed shot of the shutters. I'm think I'm going to distress them and I'm also going to hang some bunting of some kind on them. They need a little more decoration. The distressed trunk holds extra blankets. And keeps the baby out of the fireplace. Notice my Valentine's mantle? I love love. I don't want to take it down. My workspace is right behind the chairs. It's just enough space for now. Until I can create a full studio space. :) When I need more space, I just move into the dining room. It's got great light and the table is excellent for crafting. You can see my messy kitchen that opens up into the family room behind the chairs. So when one of us is cooking, communication is still open into the family room. It's the perfect room for our growing family. When I first opened Madsy Bella Boutique, I had zero inventory. 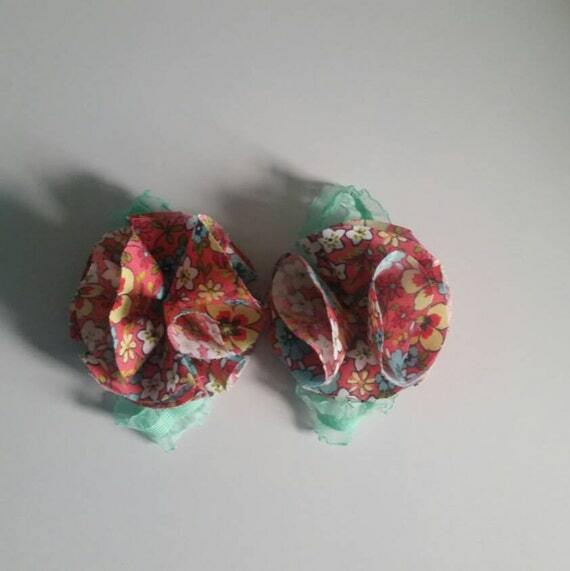 Every item was a custom order and I had a couple of prototypes (Madsy & Bella's tutus) for clients to view. As the business has grown and I've added items, I've decided to change things up a bit. 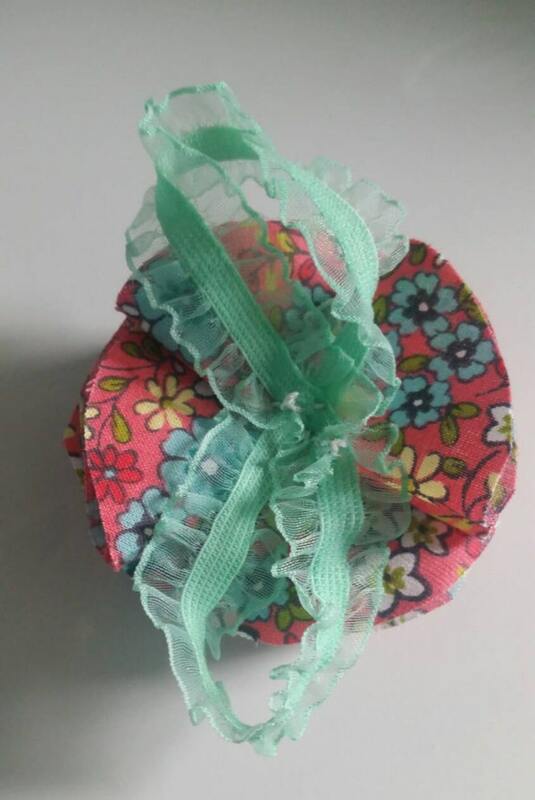 I've decided to keep a few pre-made items in the shop regularly, starting with tutus and hair bows/bow ties. It's nice having some inventory on hand and not having to rush to the fabric store each time an order is placed. 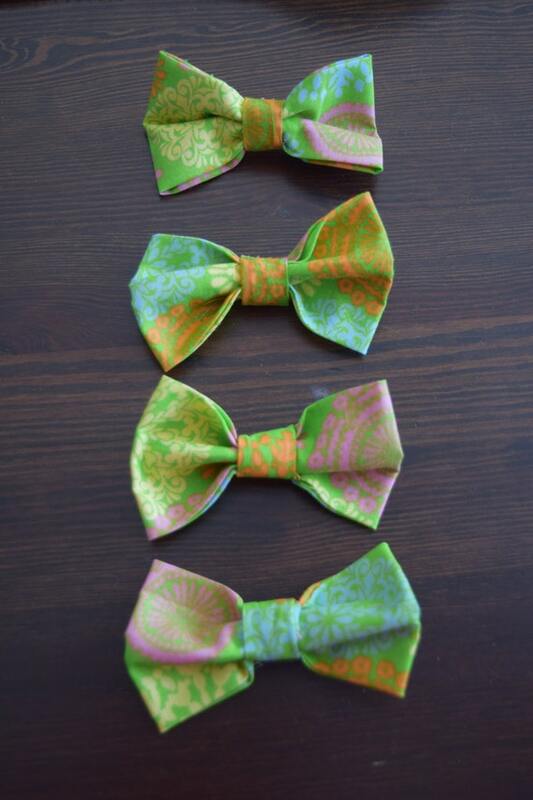 In the past couple of weeks, I've added 3 different prints of hair bows/bow ties and 2 tutus. 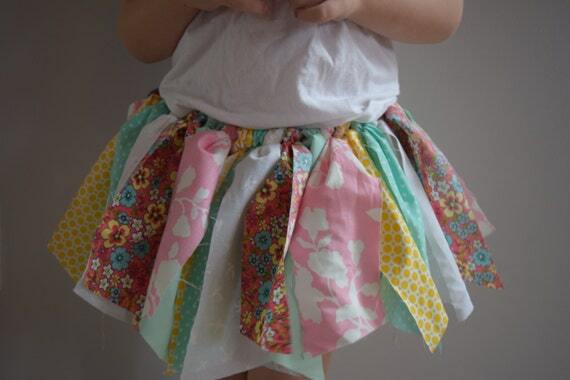 I've been craving spring like crazy, so buying this fabric and creating this tutu was such a pleasure. 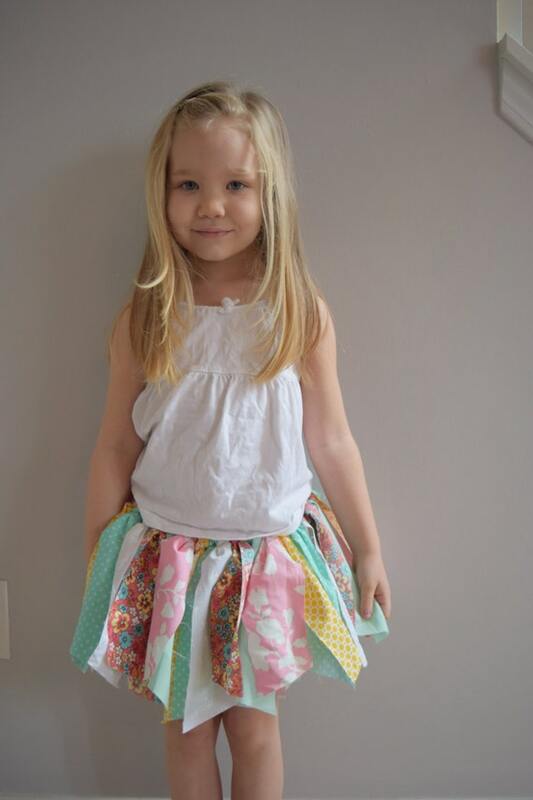 It fits sizes 3T-5T and is absolutely adorable, with a bit of vintage flair. 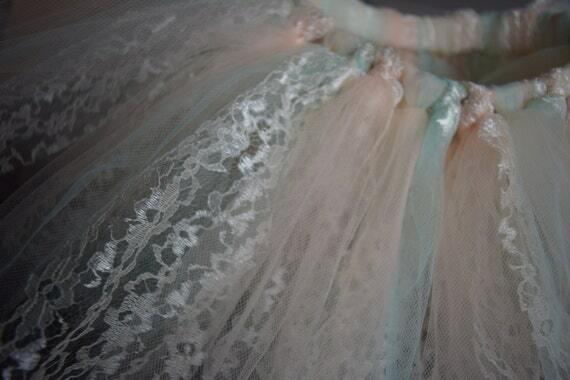 With Easter coming up, I thought it'd be nice to add a traditional tulle tutu. 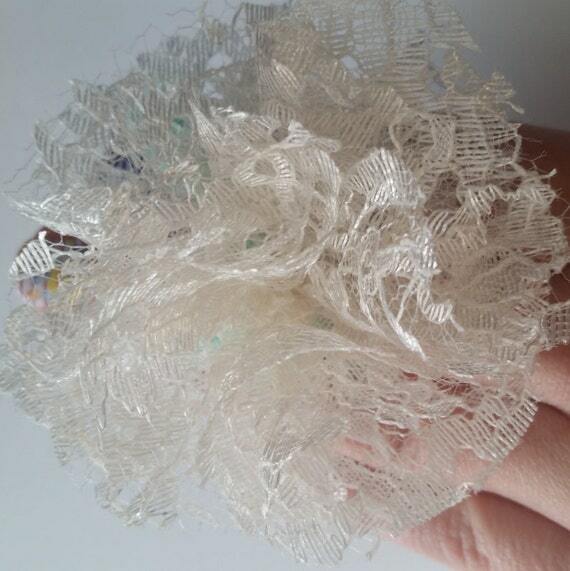 I changed it up a bit by adding a beautiful ivory lace tulle that has a subtle sheen. 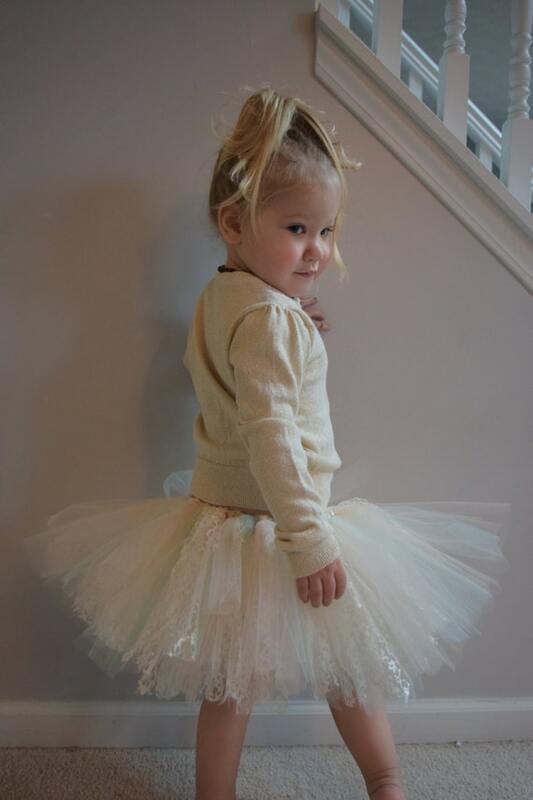 The tulle tutu fits sizes 2T-4T and is ready to ship in 1-2 business days. 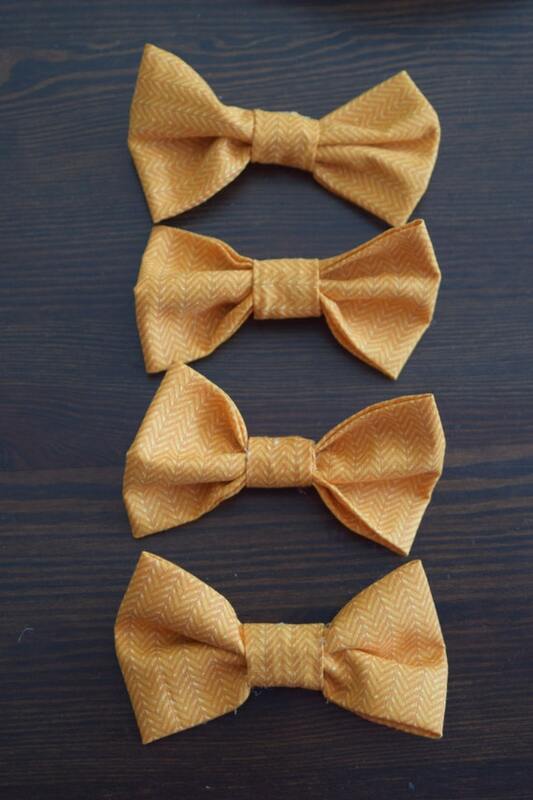 The three new bows can be used as hair bows or bow ties. They have an alligator clip affixed to the back and are only $3! Now visit the shop and stock up on all of the CUTE!! Sunday, February 1st our family and friends gathered in our home to celebrate Noah's first birthday. I can still remember his birth like it was yesterday. One of the first things I noticed about Noah was how big his hands were. And everything about him has been big ever since-not just his size. His personality is HUGE. He loves hard and he snuggles sweet. He has typical tantrums, but they pass just as suddenly as they begin. He is the perfect addition to our crazy family and I couldn't imagine life without him. You could tell that he knew the party was for him. He was the life of the party and was ecstatic the entire time. His cousins and our friends kids were here, so he had plenty of kids to play with and thought he was a big boy for keeping up with all of them. I made superhero masks for all of the kids and capes for my three. It was cute watching all of them in their superhero costumes. He had never had cake before, so he had no idea what to think of it. After helping him dig into it, he was in LOVE! The after party consisted of a balloon fight with Big Sister. It was his first and quite possibly his favorite part of the party. We also managed to get a family photo out of the day. Family photos are a lot more difficult than they used to be...but this is real life, right?! My favorite part about this photo is that we're all blurs. Except Madelynn. So it's like she froze time. Hahahaha! Sweet Noah, my prayer for you for this lifetime is that you are always true to yourself and honor God first and foremost. Don't follow the crowd, don't try to fit in. Stand up for what is right and be a leader. Lead with love, but don't let it weaken you. I love you so much, my little man.